​A senior US Air Force official called the current situation with Russia “the biggest threat” on her mind, hinting at a possible display of power that could see American military aircraft, including F-22 Raptor fighter jets, deployed to Europe. The Air Force is now considering a plan to further increase the number of its rotational forces in Europe, the US Secretary of the Air Force, Deborah Lee James, told reporters at the Paris Airshow at Le Bourget. When it came to details, the official only said she saw “no reason” why the fifth-generation F-22 fighter jets could not be stationed in Europe, but refused to elaborate. 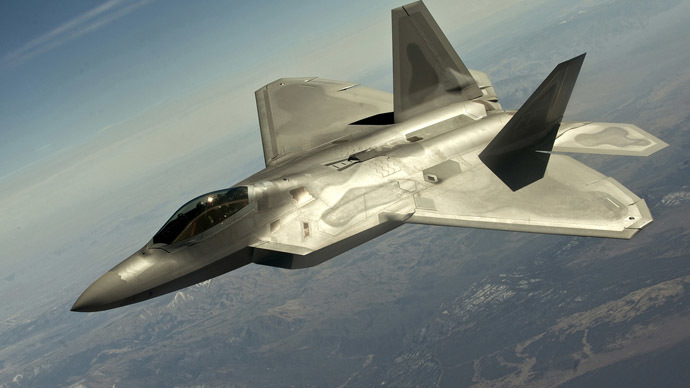 The Lockheed Martin F-22 Raptor is a highly advanced stealth tactical fighter aircraft introduced in 2005. The jet’s export is banned under US federal law. After France, the Air Force official is set to visit other NATO member states – Britain, Italy, Cyprus, Poland and Germany. She plans to urge all of them to boost military spending. “We’ll be reassuring those allies we are standing shoulder to shoulder with them,” James added, while pointing out that countries like the UK that wish to cut down on defense and military expenses are a concern. In the Baltics, the US Air Force has already stepped up the number of its air patrols, while the UK has received B-2 stealth bombers and B-52 bombers. From 2020, the US is set to station F-35 fighters at RAF Lakenheath in the UK. All these moves are intended as a display of its military might in Europe. On Monday, addressing the US and its allies, the Russian Foreign Ministry said Moscow hopes the “situation in Europe will be kept from sliding towards new military confrontation fraught with dangerous consequences,” according to its statement.